The Profile of Emotional Distress (PED) is an instrument elaborated to assess the subjective dimension of functional and dysfunctional negative feelings (affect). To our knowledge, this is the first self-report instrument, elaborated based on Albert Ellis’s binary model of distress, designed to focus solely on the subjective dimension of emotions. Reliability, validity, and normation studies for the Romanian population were conducted on a group larger than 700 participants. Internal consistency coefficients (Cronbach’s alphas) ranged from .75 to .94, which are considered good values for a self-report instrument. Key words: binary model of distress, functional and dysfunctional negative feelings, rational emotive behavior therapy, reliability, validity, norms for Romanian population. What we experience as content, sadness, worry, joy, fury, fear or regret results from the unique combination of the way we think, the way we behave and the bio-physiological changes taking place in our body when we face a life event. Emotions are therefore dependent variables of multiple changes at different levels (David, Holdevici, Szamoskozi, & Băban, 2000; David & Brown, 2002; Szentagotai, 2006). While the intensity of an emotion is mainly determined by the level of physiological arousal, its quality (e.g., the fact that we call it “fear” and not “sadness”) results from the cognitive components implicated (Schachter & Singer, 1962; David & Szentagotai, 2006). Even though from the lay perspective affectivity is seen as very complex system of emotions, researchers were able to demonstrate that there are only a few basic dimensions. In a series of studies, Watson and Tellegen (1985) proved that affect has two uncorrelated dimensions: positive emotions and negative emotions. Positive emotions are measured by the amount of pleasure and content experienced, while negative emotions are indicated by the degree of unpleasantness experienced (psychological distress). Based on his extensive clinical experience, Ellis (1962; 1994) formulated the binary model of distress (David, Schnur, & Belloiu, 2002; David, Montgomery, Macavei, & Bovbjerg, 2005), separating for the first time the negative emotions in two categories: functional negative emotions and dysfunctional negative emotions. The functional or dysfunctional character of an emotion is given by: (1) the associated subjective experience, (2) the associated beliefs and (3) the behavioral consequences of the emotion (David & Szentagotai, 2006; Ellis & DiGiuseppe, 1993; Szentagotai & Freeman, 2006). This categorization is based on the qualitative difference that exists between emotions with the same valence (i.e., negative or positive) – difference due mainly to their underlying cognitions – and not on the variations of intensity (Ellis 1994; Ellis & Harper, 1975). In other words, a higher intensity of “sadness” is not called “depression”, the difference between the two emotions coming from the specific beliefs underlying them (e.g., rational beliefs for functional negative emotions and irrational negative beliefs for dysfunctional negative emotions). At the subjective level, the differences between functional and dysfunctional negative emotions have been investigated in a number of studies, with results indicating the existence of some quantitative and qualitative differences between these two types of emotions (Kassinove, Eckhardt, & Endes, 1993; David, Schnur, & Birk, 2004; Opriş & Macavei, 2005). The Profile of Emotional Distress (PED) is an instrument elaborated to assess the subjective dimension of functional and dysfunctional negative emotions. The PED is a 26-item self-report instrument that measures functional and dysfunctional negative emotions from the “concern/anxiety” and “sadness/depression” categories. The scale allows for the calculation of a general score of distress (all items) and also of separate scores for “concern – functional”, “anxiety – dysfunctional”, “sadness – functional” and “depression – dysfunctional”. The scale was elaborated by Opriş and Macavei (2005), based on the Profile of Mood States, Short Version (DiLorenzo, Bovbjerg, Montgomery, Valdimarsdottir, & Jacobsen, 1999) and other mood scales. In addition to the items selected from POMS-SV, we added items with similar meaning extracted from a Romanian Synonyms Dictionary. The 26 items of the final version are those that remained following expert validation and experimental studies designed to establish their relevance and the subscale in which they fit. The effectiveness of the scale is enhanced by the fact that it allows a global estimation of distress, as well as the calculation of separate scores for functional negative emotions, dysfunctional negative emotions, functional concern, dysfunctional anxiety, functional sadness and dysfunctional depression. Compared to other instruments, the PED has a relatively small number of items, phrased in an accessible wording, easy to administer and score. 12 items represent functional and dysfunctional negative emotions in the “concern/anxiety” category. The possible responses are: “Not at all”, “A little”, “Moderately”, “Quite a bit” and “Extremely”. Neither the items of the scale, nor the response possibilities are numbered, avoiding the bias of the responses as a result of the attached numbers (see Appendix 2). The 26 items are scored directly. Each answer is assigned a 1 to 5 value, as follows: Not at all = 1, A little = 2, Moderately = 3, Quite a bit = 4, Extremely = 5. The global score is obtained by adding the scores of all 26 items. The highest possible score is 130 (5×26 items), while the lowest possible score is 26 (1×26 items). The higher the score, the more distress the subject experiences. Apart from the global score of distress, specific scores for all subscales can be computed, by adding the corresponding items (see Appendix 1). The reliability of a psychological instrument refers to the accord or expected stability of analogue measurements. If an instrument is reliable, results observed in similar conditions have certain stability over time (Dempster & Brainerd, 1995). Reliability is most often expressed based on internal consistency coefficients and score stability in time (Anastasi, 1988). The internal consistency of a scale refers to the extent to which all items refer to the same construct. Test results stability indicates to what extent similar results are obtained testing the same subject at different times. The reliability of PED was estimated by computing Cronbach’s Alpha internal consistency coefficient. The sample used consisted of 745 subjects, Alpha values for both global scores and scores by scales ranging between .75 and .94 (see Table 1). These values indicate a very good internal consistency, meaning that the items of the test measure the same construct – emotional distress. The smallest values are found for the “concern/anxiety” scale (between .75 and .81), but even these are large enough to indicate acceptable reliability. Table 1. Descriptive statistics and internal consistency Alpha values for the PED scales. Validity is the characteristic of a test/scale, which reveals how much it measures what it is suppose to measure. In other words, validity refers to the extent to which the inferences drawn from the obtained results are correct (Messick, 1995). 1. Content validity refers to the systematic examination of the test/scale items to determine if they cover a representative sample of the measurement domain. The starting point in the development of the PED was the POMS-SV scale (DiLorenzo et al., 1999), from which we used some items of the “Tension/Anxiety” and “Depression” subscales. Other items were selected from the POMS scale (McNair, Lorr, & Droppelman, 1971), from the corresponding two subscales. Using a Romanian dictionary of synonyms, more words having a close meaning to those already in the list were added. This way, we managed to produce a list of 41 words. To classify them as representing functional or dysfunctional emotions, the words were rated by 3 experts in rational emotive and cognitive behavioral psychotherapy from the Romanian Association of Cognitive and Behavioral Psychotherapies. The 26 items of the final version of the test are those upon which a consensus was reached by the expert evaluators. Thus, the PED was developed such as to reflect the principles of rational-emotive and cognitive behavioral theory; the overall structure of the PED resembles that of other similar tests that have already proven their utility. 2. Construct validity refers to the extent to which a test/scale expresses the measured construct. It reflects “the degree to which test results correlate with results from another assessment instrument which is supposed to measure the same or a similar concept” (Haynes, apud Silva, 1993). The following three studies were conducted to test the construct validity of the PED. § the positive correlation between emotional distress and anxiety and depression (evaluated as syndromes – cognitive, behavioral, physiological and subjective responses). A total of 701 subjects volunteered to participate in the study developed to assess the psychometric properties of the PDE. University students participated in exchange for course credits, while the other subjects were selected from the respondents to public announcements. All subjects were properly informed about test procedure, use of data and confidentiality. A parent or legal guardian provided agreement for underage subjects. Because some of the subjects failed to provide data concerning gender, educational level, age, and marital status, descriptive statistics reported below will reflect these missing data (Table 2). Dysfunctional Attitudes Scale – form A (Weissman, 1979; Weissman & Beck, 1978) is a 40-item self-report instrument, which is used to evaluate the presence of dysfunctional attitudes/beliefs associated with the depressive symptoms. Beck Depression Inventory (Beck, Rush, Shaw, & Emery, 1979) was used as a measure of current depressive symptoms. BDI is a 21-item self-report measure of depression, with excellent psychometric properties (high internal consistency, retest reliability and convergent validity), as well as sensitivity to clinical change (Beck, Steer, & Garbin, 1988). Table 2. Descriptive statistics for subjects included in study. Attitudes and Beliefs Scale 2 (DiGiuseppe, Leaf, Exner, & Robin, 1988) was used as a measure of irrational beliefs. ABS2 is a 72-item scale and a valid measure of the four irrational beliefs central to rational emotive behavior therapy (REBT). It has high internal consistency and discriminative validity for the Romanian population (Macavei, 2002). Unconditional Self-Acceptance Questionnaire (Chamberlain & Haaga, 2001) is a 20-item self-report instrument that measures unconditional acceptance of self. It is based on Albert Ellis’s theory of personal acceptance, the items reflecting different aspects of this complex concept. The questionnaire allows for the calculation of a global score, with high values expressing unconditional self-acceptance, and low values expressing conditional acceptance of one’s personal worth. Empirical data (Chamberlain & Haaga, 2001; David et al, 2002) suggest unconditional self-acceptance is a protective factor against emotional distress when facing negative life events. Profile of Mood States-Short Version (POMS-SV) is a 47-item instrument that measures transient levels of distress. This is a short version (Shacham 1983) of the classic mood adjective checklist (McNair et al, 1971) that allows for the assessment of six affective dimensions and provides a total distress score. Test-retest reliability for each of the subscales has been found to be consistent with the long version, and the subscales have been demonstrated to have good criterion validity (DiLorenzo et al, 1999). Automatic Thoughts Questionnaire is a 30-item self-report measure of depression-related automatic thoughts, elaborated in 1980 by Hollon and Kendall. It consists of statements reflecting idiosyncratic depressive thinking (Beck, 1976, Beck, 1995). State and Trait Anxiety Inventory – STAI-X1 and STAI-X2 (Spielberger, 1983) is composed of 2 scales, each of 20 items, and is designed to measure two aspects of anxiety: anxiety as a state and anxiety as a trait. Young Schema Questionnaire – Long version 2 – YSQ-L2 (Young, 1994) has 205 items assessing 16 types of dysfunctional cognitive schemas involved in the development of personality disorders. After giving an informed consent, participants were interviewed and completed individually all instruments mentioned above, in random order, without time limit. Persons under 18 years of age were allowed to participate following consent of a parent or legal guardian. Results outline the positive relation between dysfunctional negative emotions and cognitive distortions (Table 3). It should be noticed that, although participants did not report having experienced emotional problems, correlations between dysfunctional negative emotions (DNE) and cognitive distortions evaluated by the DAS-A, ATQ, ABS2-IB, YSQ-L2, in this order (CD), are systematically somewhat higher than correlations between functional negative emotions (FNE) and the same cognitive distortions (CD-DNE .28, .49, .30, .43 versus CD-FNE .22, .44, .22, .37). Moreover, rational beliefs and unconditional self-acceptance are both negatively associated with emotional distress – evaluated as a combination of functional and dysfunctional emotions. These results could suggest the possible protective role of those cognitions, but further investigations are required. In the same time, there are fairly high, statistically significant, positive correlations between the emotional distress (measured by the PED) and depression and anxiety (evaluated as syndromes, by BDI and STAI). The correlation between the PED global score and BDI, STAI-X1 and STAI-X2 are, as follows: .56, .58 and .47. Table 3. Correlations between PED scores and other functional and dysfunctional cognitions and emotions assessment instruments. PED – sadness/ depression dysfunct. PED – concern/ anxiety dysfunct. There is also a strong positive correlation between the total PED score, the global POMS score, and the POMS negative scale: .74 and .75 respectively, these being the highest correlations found between the PED and other instruments. The explanation for this result is that both the PED and the POMS measure the subjective dimension of emotions. The PED total score correlates negatively with the POMS positive scale: -.46 . B. The second study revealed the factorial structure of the PED. We tested two separate groups of subjects, one including subjects without psychopathology (N=122) and the second including subjects diagnosed with anxiety disorders or major depressive disorder (N=32) (Macavei & Opris, 2006 – unpublished manuscript). The Principal Components Analysis (PCA) yielded two factors in both studies. In the first study, results showed loadings of 62% on the first factor and of 28% on the second factor. In the second study, results showed loadings of 60% on the first factor and 29%, on the second factor. Consequently, together they explain 90% and 89% of the scores. In accordance with Albert Ellis’ binary model of distress – also investigated in other studies (David et al., 2005) – the two factors were named “general distress” (functional and dysfunctional negative emotions) and “functional distress” (functional negative emotions). C. In the third study we investigated how much extreme distress score groups (PED) differ regarding both cognitive distortions and cognitive protective factors. We used the following instruments: ABS2 (evaluations), YSQ-L2 (schemas), DAS-A (dysfunctional attitudes) and USAQ (unconditional self acceptance). Results show that subjects reporting high levels of distress have significantly higher levels of maladaptive cognitive schemas, irrational beliefs and dysfunctional attitudes, and lower levels of unconditional self-acceptance, compared to those who experience a lower level of distress (see Table 4). Table 4. Descriptive statistics and comparisons between extreme groups. Norms were developed using five normal classes. The first class includes 6.7% of subjects, those with the lowest level of emotional distress. The second class includes the next 24.2% of the subjects, the third class includes the next 38.2%, and the fourth class includes the next 24.2% of subjects. The fifth class also includes 6.7% of subjects, those with the highest level of emotional distress. There are no significant gender differences for the “PED global score” and the “PED – dysfunctional negative emotions”, so that the norms are valid for both males and females (see Table 5). Gender differences were found for the “PED-functional negative emotions score”, thus separate norms for males and females were elaborated (see Table 6). Table 5. Descriptive data and levels of significance for comparisons by scales, as a function of gender. Table 6. Norms for the PDE. The “Profile of Emotional Distress” is an instrument designed to assess subjective experiences associated with emotions, specifically negative emotions from the depression and anxiety category, in the adult population. The instrument was developed based on our earlier research, showing that, at the subjective level, there are qualitative differences between functional and dysfunctional negative emotions. Thus, this is a first step of adapting the subjective level psychological assessment tools to match the theoretical assumptions of Albert Ellis’s binary model of distress. We believe that this subjective level-aiming instrument is a welcome addition to those already existing for the behavioral and cognitive levels. Also, we would like to point out that this instrument only covers the depression and anxiety categories. This is due to the fact that they are the most widely encountered emotional problems. The development of tests dealing with other types of emotions (i.e. guilt, fury) is a desirable continuation of the present research. The reliability studies found high Cronbach’s alpha values, ranging from .75 to .94 for the total score and for the scales. These values indicate a very good internal consistency. We showed that PED has a good content validity. Three separate studies provided evidence for appropriate construct validity. The results are consistent with Albert Ellis’ binary model of distress, upon which this test was built. The first study showed a positive correlation between emotional distress measured by the PED and cognitive distortions. In the second study we found two factors, explaining about 90% of the results. These two factors were named “general distress” (functional and dysfunctional negative emotions) and “functional distress” (functional negative emotions). Results from the third study show that subjects with a high level of distress have significantly higher levels of maladaptive cognitive schemas, irrational beliefs and dysfunctional attitudes, and lower levels of unconditional self-acceptance, compared to those who experience a lower level of distress. Norms for the Romanian population are also presented. A very important limitation of this study is the insufficient testing on clinical population. To conclude, data obtained until now suggest that the PED has good psychometric properties and can be used to evaluate distress in the non-clinical population. Beck, A.T., Rush, A.J., Shaw, B.F., & Emery, G. (1979). Cognitive therapy of depression. Guilford Press: New York. David, D., & Brown, R. (2002). Suggestibility and negative priming: Two replications studies. International Journal of Clinical and Experimental Hypnosis, 50, 215-280. David, D., Holdevici, I., Szamoskozi, Ş., & Băban, A. (2000). Psihoterapie şi hipnoterapie cognitiv-comportamentală. Editura Risoprin: Cluj-Napoca. David, D., Montgomery, G.H., Macavei, B., & Bovbjerg, D. (2005). An empirical investigation of Albert Ellis’ binary model of distress. Journal of Clinical Psychology, 61, 499-516. David, D., Schnur J., & Belloiu A. (2002). Another search for the “hot” cognitions: Appraisal, irrational beliefs, attributions, and their relation to emotion. Journal of Rational-Emotive and Cognitive-Behavior Therapy, 2, 93-131. David, D., Schnur, J., & Birk, J. (2004). Functional and dysfunctional feelings in Ellis’ cognitive theory of emotion; An empirical analysis. Cognition and Emotion, 18, 869-880. David, D., & Szentagotai, A. (2006). Cognition in cognitive-behavioral psychotherapies; toward an integrative model. Clinical Psychology Review, 26, 284-298. Dempster, F.N., & Brainerd, C.J. (1995). Inference and inhibition in cognition. San Diego, CA: Academic Press. DiGiuseppe, R., Leaf, R., Exner, T., & Robin, M.W. (1988). The development of a measure of rational/irrational thinking. Paper presented at the World Congress of Behavior Therapy, Edinburgh, Scotland. DiLorenzo, T., Bovbjerg, D., Montgomery, G.H., Valdimarsdottir, H., & Jacobsen, P. (1999) The application of a shortened version of the profile of mood states in a sample of breast cancer chemotherapy patients. British Journal of Health Psychology, 4, 315-325. Ellis, A. (1994). Reason and emotion in psychotherapy (re. ed.). Secaucus, NJ: Birch Lane. Ellis, A., & Harper, R.A. (1975). A new guide to rational living (rev. ed.). Hollywood, CA: Wilshire Books Company. Ellis, A., & DiGiuseppe, R. (1993). Are inappropriate or dysfunctional feelings in rational-emotive therapy qualitative or quantitative? Cognitive Therapy and Research, 17, 471-477. Kassinove, H., Eckhardt, C., & Endes, R. (1993). Assessing the Intensity of “Appropriate” and “Inappropriate” Emotions in Rational-Emotive Therapy. Journal of Cognitive Psychotherapy: An International Quarterly, 7, 227-239. McNair, D.M., Lorr, M., & Droppelman, L.F. (1971). EITS Manual for the Profile of Mood States. San Diego: Educational and Industry Testing Service. Messick, S. (1995). Validity of Psychological Assessment. American Psychologist, 50, 741-749. Opriş, D., & Macavei, B. (2005). The distinction between functional and dysfunctional negative emotions; An empirical analysis. Journal of Cognitive and Behavioral Psychotherapies, 5, 181-195. Schachter, S., & Singer, J.E. (1962). Cognitive, social and physiological determinants of emotional state. Psychologial Review, 69, 379-399. Silva, F. (1993). Psychometric Foundations and Behavioral Assessment. Sage Publications: London. Spielberger, C.D. (1983). Manual for the State-Trait Anxiety Inventory (STAI). PaloAlto, CA: Consulting Psychologists Press. Szentagotai, A. (2006). Irrational beliefs, thought suppresion and distress – A mediation analysis. Journal of Cognitive and Behavioral Psychotherapies, 6, 119-127. Szentagotai, A., & Freeman, A. (2006). An analysis of the relationship between irrational beliefs and automatic thoughts in predicting distress. 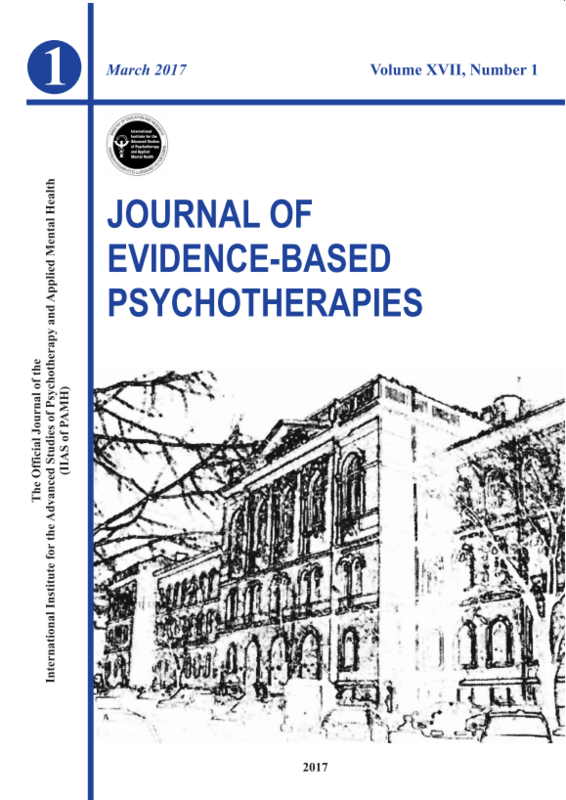 Journal of Cognitive and Behavioral Psychotherapies, 1, 1-9. Weissman, A.N., & Beck, A.T. (1978, November). Development and validation of the Dysfunctional Attitude Scale: A preliminary investigation. Paper presented at the meeting of the Association for the Advancement of Behavior Therapy, Chicago. Young, J.E. (1994). Cognitive Therapy for Personality Disorders: a Schema-Focused Approach. Sarasota: Professional Resource Press. A confirmatory factor analysis of the attitudes and belief scale 2Is repressive coping associated with suppression?